South Korean mobile shoppers used e-commerce platform Coupang the most in October, which saw about a 23 percent increase in the number of its monthly active users, industry data showed Tuesday. According to mobile application analysis company Wise App’s survey conducted on 23 million Android phone users here, at least 8.18 million of them had used Coupang for mobile shopping last month. It was followed by 11st with some 5.95 million monthly active users (MAUs) and WeMakePrice with 4.36 million users. 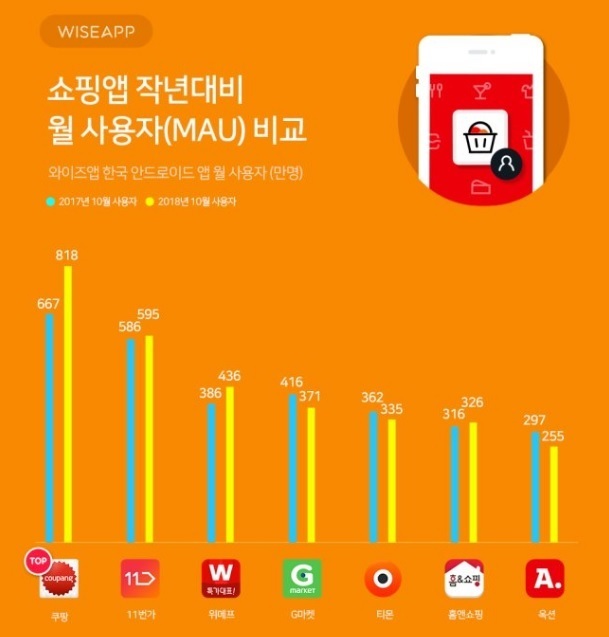 E-bay Korea’s G-Market ranked fourth with 3.71 million users, which was followed by Tmon, Home and Shopping and Auction. Different age groups also showed different preferences for shopping apps. Women in their teens used shopping apps for fashion items like Zigzag and Style Share the most. These apps had some 440,000 users and 300,000 users in the last month, about double the 220,000 users who used Coupang. Women in 50s or older also used home shopping apps and department store apps for their mobile shopping. Amid fierce competition in the e-commerce market here, many companies are striving to attract more customers via limited price flash deals or fast delivery services. 11st ran its biggest sales promotion of the year earlier this month, mimicking Black Friday in the US and Singles Day in China. E-bay Korea, an operator of online malls G-market and Auction, has also run discount promotions on popular products like Sony’s PlayStation 4. Coupang, the largest online retailer here in terms of the number of items sold online, has 4 million items available for the next-day delivery through its Rocket service.